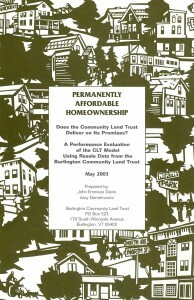 Permanently Affordable Homeownership is a study of resale data from Burlington Community Land Trust–established 1983– prepared by John E. Davis and Amy Demetrowitz of Burlington Associates. Completed in May 2003, the study evaluates the effectiveness of the CLT model in delivering permanently affordable homeownership opportunities. $4.00 plus $1.50 shipping and handling.